Sunday, November 22 will mark fifty-two years since President Kennedy was murdered by Lee Harvey Oswald, while driving through Dealey Plaza in Dallas, Texas. This is the week – while that tragic event is on people’s minds and in the news – to share my new documentary, Conspiracy Theorists Lie (2015). 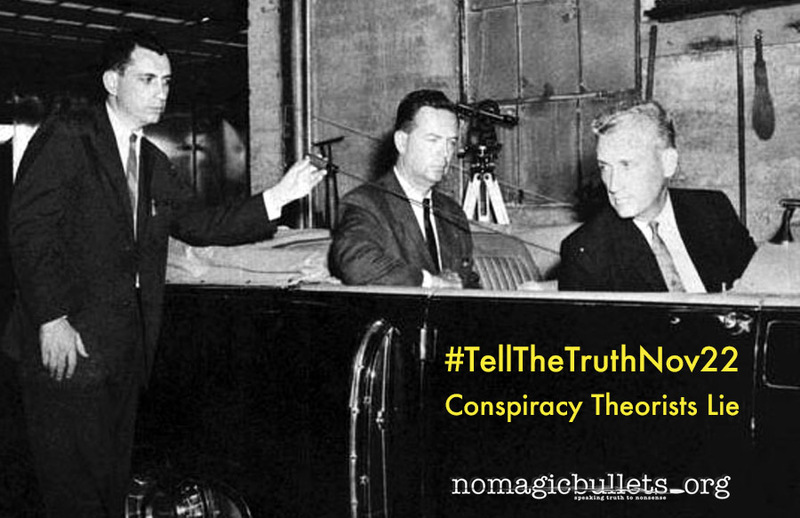 Tweet it, Post it, Pin it, Share it – be social about it – and be sure to #TellTheTruthNov22! You can direct people to this special #TellTheTruthNov22 page, where they can find things to watch, listen to, read and share. The conspiracists have dominated this conversation for far too long, with their wild and ahistorical vision of history. Help me speak truth to nonsense and show people that conspiracy stories aren’t funny entertainment, they are dangerous misconceptions of reality. Thank you for your support of me and my work!